This mini ethnography project takes a look into the world of food and immigration through the lens of German-Americans living in Michigan today. The United States Census of 1900 showed that German immigrants have settled in widespread areas across the nation (Faust, 1906), a result of mass migrations of Germans to America between 1800 and 1920 (Lawrence, 2004). Food is one way you can see a culture move from one place to another and change with time. As observed through our ethnography, German food in America has changed with time as well as the interactions with this food as more generations are being born in America. We will be looking at why German food has changed in the U.S. and how the culture centered on German food is passed down to younger generations. Photo 1. 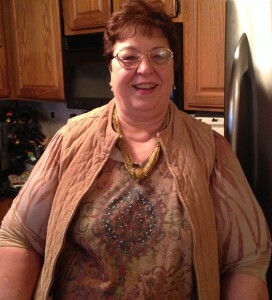 Delores, our main informant, photographed in her home during our interview. To find this information, we interviewed Delores, Henne, Ruth, and Steve. Delores, Henne, and Ruth met each other through their church in Grand Rapids, MI. Steve is Delores’s only son. Delores is the main informant and she connected us to the other participants of the study through her relations to them. Delores is not German herself, but she gained cultural appreciation toward German food after marrying her German husband Robert F. whose family came over to the US in the 1920s. Her knowledge about her husband’s family history and German food was the reason she was chosen as our main informant. Her story is a unique one as she did not grow up around German food like the rest of our informants. Henne and Ruth both go to St. Mark’s Lutheran Church in Grand Rapids, MI with Delores which is how their friendships formed. Henne was born in northern Germany and moved to the US in 1962 when she married her husband. She has now been in the US for about 50 years, and all five of her children were raised in America. She is still in contact with friends from her sixth grade class and will email them as well as some family still in Germany. Henne is still connected to her ethnic roots. She still knows the German language, but English now comes better to her due to the fact that she uses it more often. Henne did not go back to Germany very often at first, but she began going about every five years. Henne began learning how to cook in Germany, but did not actually start cooking until she came to the US, because she worked and was fed at a hospital in Germany that she worked in. Since coming to America she has learned how to cook many of different German dishes. Photo 2. Henne, a first generation German-American, photographed in Delores’s home during our interview. Ruth’s parents came to the US after WWI and left the majority of their family in order to do so. Her father came in 1928 and her mother two years later. She was born in the US and married a French and English man. She also participates in cooking German food by learning through her mother through observation before she died when Ruth was 18. Since Ruth’s mother died when she was still young, she had to teach herself to cook through German recipes. Henne is our only informant who is directly from Germany and Ruth is our first generation informant. Photo 3. 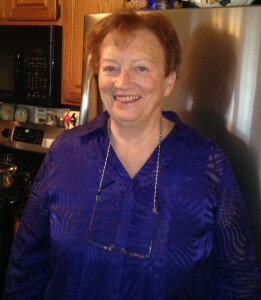 Ruth, a second generation German-American, photographed in Delores’s house during our interview. Steve is Delores’s son, and he was born in America as well. He learned how to cook German food growing up, because he was surprised that none of his male friends knew how to cook. As a result, he began watching his parents cook in order to learn. He is the youngest generation that we interviewed, but also has kids of his own. He is a 3rd generation German-American. When Delores married Robert she began learning about the refugee story of their family. Cooking and consuming German food for Robert’s family became a way to talk about their background and their journey to the US. Robert’s ancestors lived in Russia in German settlements. The formation of these settlements began back in 1703 with the marriage of Catherine the Great from Germany and Peter the Great from Russia (Clements, 2012). This allowed completely ethnically German villages to arise in Russia, but in 1917 a civil war broke out in Russia, pitting the Red Army (under communist rule) against the White Army (forming a resistance to the communist rule) (Mawdsley, 2007). This was a bloody war and the Red Army would shoot civilians if they were hiding anything in their house. Robert’s ancestors were in the white army, and knew that their life would be at risk if they stayed in Russia. As a result, they gathered their family, some of whom resided in an orphanage, and fled over a frozen river in the winter to escape the country. Photo 4. 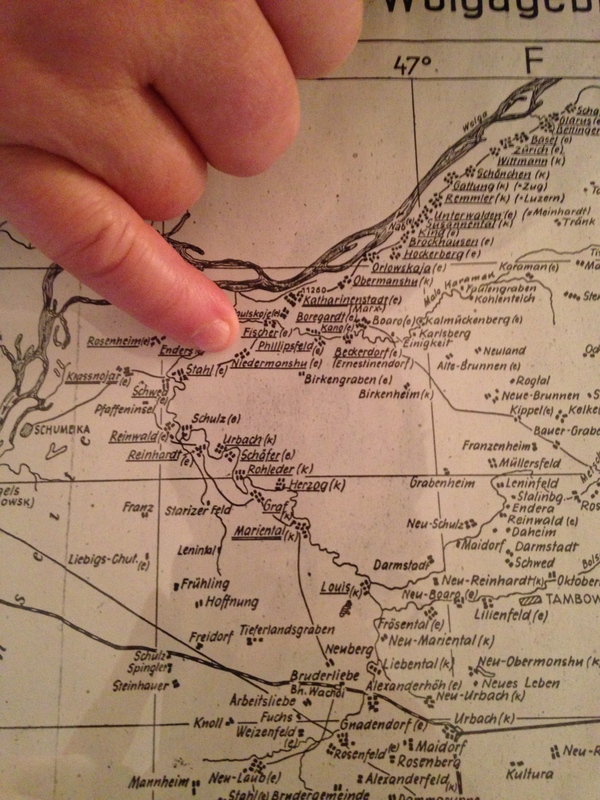 Delores point on a map of German settlements to the area from which Robert’s ancestors came. From there Robert’s family stayed in Germany and Poland before immigrating to the United States, an experience common to many fleeing Civil War era Russia (Koenker, 1989). Some of the family came in 1923, but others had to postpone their immigration for a year due to an eye disease, most likely Trachoma (Yew, 1980), preventing them from entering the country. Delores said that the German cooking she learned was very unique because of this background. It had influences from Russia and the hardships experienced there due to the famine (Simms, 1982). Some of the more German dishes that Robert’s family learned probably came from the time they spent in Germany and Poland. 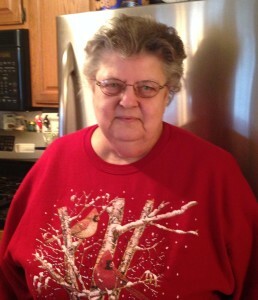 Delores enjoys cooking German food, and primarily learned through Robert’s Aunt Elsie. While Delores learned how to make many German dishes, she had us make Kartoffel N Glaze with her in our participant observation. To make Kartoffel N Glaze, you begin by boiling a large pot of water, to which salt is added. Next you peel the potatoes. Typically this dish was made for large gatherings, as such, five to ten pounds of potatoes were used, but in this case we used about a pound. In Germany, Dolores said that they did not waste any of the table scraps, so, to save money, the potato peelings were fed to the livestock. Once peeled, the potatoes were chopped and added to the boiling water. 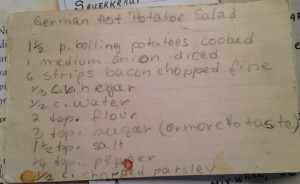 Another interesting note is that there are many different spellings for this dish, Delores’ spelling being capitalized, showing how many different ways there are to prepare this dish. While the potatoes are boiling, half of a pound of butter is melted in a large skillet. 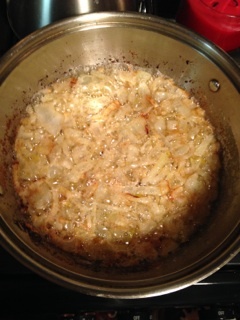 Next, onions are chopped and added into the melted butter to sauté and brown. Photo 5. The onions sautéing and potatoes boiling. 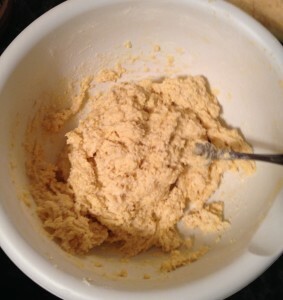 In a bowl flour, salt, and eggs are added to make the dumpling dough, with a little half and half dairy creamer added at the end to help everything to come together. Photo 6. The finished dumpling dough. 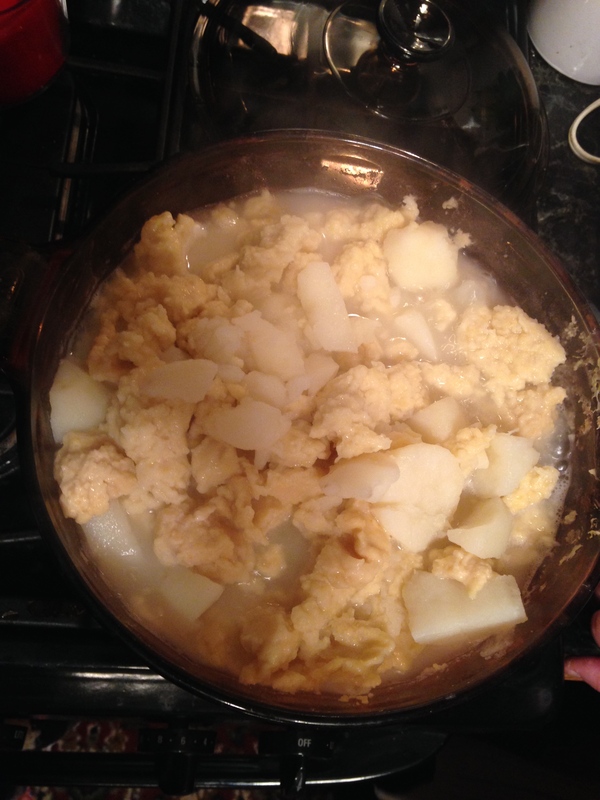 This dough is then cut into irregular chunks and added into the boiling water with the potatoes to cook. After these have cooked and the potatoes are softened, the pot is drained. Sour cream and cream are added into the pan of onions to create a sauce. Photo. 7 The browned onions. Photo 8. The potatoes and dumplings boiling. Once the sauce has thickened and reduced, the drained potatoes and dumplings are added into the pan and stirred, and then served while still hot. Photo 9. The finished Kartoffel N Glaze. Kartoffel N Glaze is seen as one dish that has altered since it has come to the United States in various ways depending on the family. 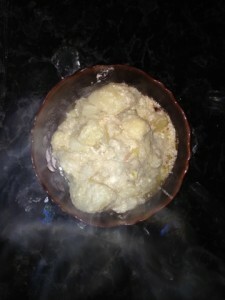 Delores said that it was important to keep the potato chunks and dumplings large, so that you could distinguish between the ingredients in the dish. When she was with family in Oklahoma trying a different family member’s version of Kartoffel N Glaze she didn’t recognize the dish because the ingredients were cut much smaller. She said that you couldn’t tell the difference between a potato, dumpling, or onion very easily at all. In Kansas, Delores said the onions were cooked differently, much more lightly there. Dolores and Robert always browned their onions when making this dish and did not use milk in it like those in Kansas. Kartoffel N Glaze has variety in the United States itself reflecting that food easily changes for the tastes of people eating it. Photo 10. 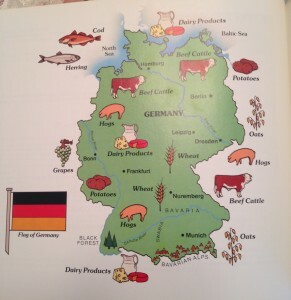 A map of Germany showing various food preferences by region. These kinds of differences arose when talking to Henne and Ruth as well. Henne was from northern Germany and Ruth’s family was from southern Germany. Henne would often describe her cooking in contrast to Ruth’s since there were differences between northern and southern Germany. Henne said that noodles and dumplings were eaten in more abundance in southern Germany. Food is flexible to change depending on the culture around it, even in the subtle variations in culture inside one country. Photo 11. 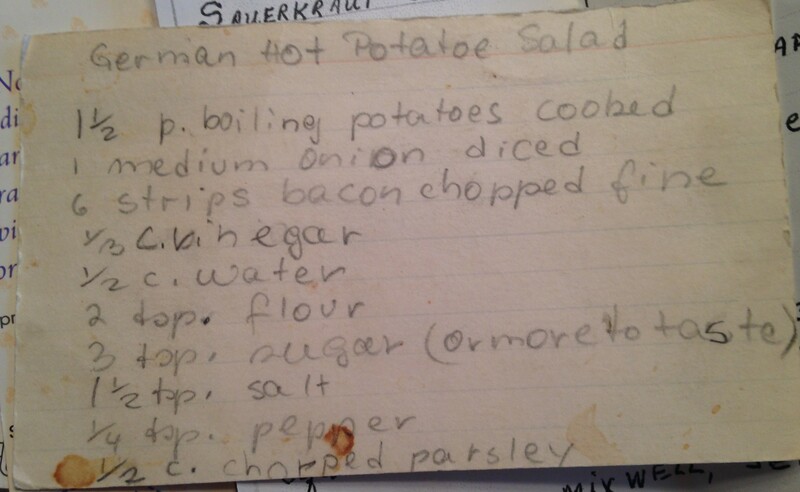 Recipe card for a German potato salad. Photo 12. 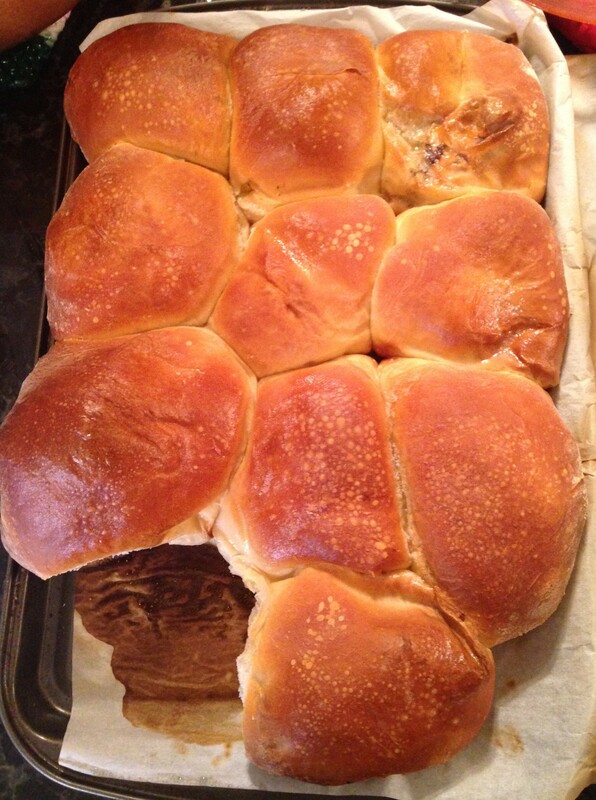 Bierocks, a traditional German bread roll. The way our informants cooked German food changed with their experiences with American food culture. Steve altered the way he cooked German food for convenience. In the interview Steve said that, “One time I went to a restaurant in Grand Rapids, Schnitzelbank, and it’s no longer there. And I tried Rouladen, and it was a braised beef steak with a pickle inside wrapped with bacon. So, I would cook that at home occasionally and being busy at that time; I was a stay at home dad, but I was also volunteering with the church and boy scouts, and helping my daughter in girl scouts. I didn’t have a whole lot of time, so I decided to make it into a casserole…I’ve altered it that way to make it easier, because it’s all about convenience now.” His wife owns an appraisal business and he currently works for an insurance company. As a result, they do not have much time to spend on cooking. Steve also concluded that the lifestyle they have right now is much faster than before, and they have an array of options nowadays in cooking. For example, people spend time watching TV, browsing the Internet. Modern technologies have changed their lives to a center on entertainments other than cooking foods. Photo 13. Sauerkraut, a cabbage-based dish, and sausages. Some changes in food consumption arise from the plain distaste towards some foods eaten in Germany. Ruth described some of the food that would be eaten on Christmas Eve when saying, “We would have blood and tongue, headcheese, salami, and different sausages too.” Delores described head cheese in more detail. She said that it was essentially big brains that were taken from the pig by boiling its head. In the past, every part of the pig was eaten, because there wasn’t an access of food. Ruth said blood and tongue “has a pretty good taste to it, if you can get passed what it’s called.” Ruth’s dad loved making headcheese. Tongue also made really good lunch meat if you sliced it up. Ruth didn’t make these things too often though, because her kids would often stay away from these foods not commonly eaten in America. Ruth and Henne also both discuss how the people their kids married often did not like sauerkraut. Delores said that in the past cabbage was turned into sauerkraut for increased preservation, which is why it is in so much German food. In America less people have a taste for this, and do not have to eat sauerkraut because there are so many other options for food. Photo 15. Rouladen, a classic German dish. Tastes vary from culture to culture, but the ingredients available also influenced how dishes change. Often our informants could not find the same ingredients that were used in the original German food. The particular dish Steve mentioned is Kasse Noodles. The cheese that should be used in traditional German Kasse Noodles is not available in American supermarkets, so he has to adapt to cottage cheese – the closest replacement. According to Steve, the cheese in Germany was “thicker, still had curds in it, but it was more solid than our cottage cheese.” Another informant Henne also talked about the changes in the way cooking traditional German food. “I’ve started using more herbs on things, I love rosemary,” Henne stated. Adding a bunch of herbs into the food occurred in America, but they did not have too many herbs when she was growing up in Germany. Her grandfather used to have a garden to grow teas with mint and chamomile. She does not have a garden to grow the herbs sehe needed in Germany, but she now likes to add onions, rosemary, chives and leeks when she is cooking German food. Leeks were actually used in Germany. They are kinds of like an onion and she continues to enjoy using them in her cooking here. One interesting category Henne mentioned is that they used to eat a bunch of wild meats from duck, goose, rabbit and boar since her uncle hunted very often in Germany, however, she only buys these meats after moving to America. Photo 16. A German fruit torte baked by Henne. Delores states that the ingredients they used for cooking in America have changed, too. Thanks to the growth in living standard, she likes to use more meats in cooking than before, and probably uses more sauerkraut. In addition, since she has an array of choices of sausages in markets, she sometimes utilizes different sausages during cooking. The food Delores cooks is also unique because it has ingredients influenced from Russia. Since Robert’s family fled Russia during the time of a famine, most of their food was made with bread, milk, onions, cream, and cabbage. There was very little meat in their food because it was scarce. A lot of the German food here is different because America has high dietary intake of meat whereas it was used for flavoring rather than substance in a lot of the dishes Robert’s family used to make. For example bierocks used to be primarily made with cabbage, onions, and other vegetables, however, some people now fill it mostly with meat. 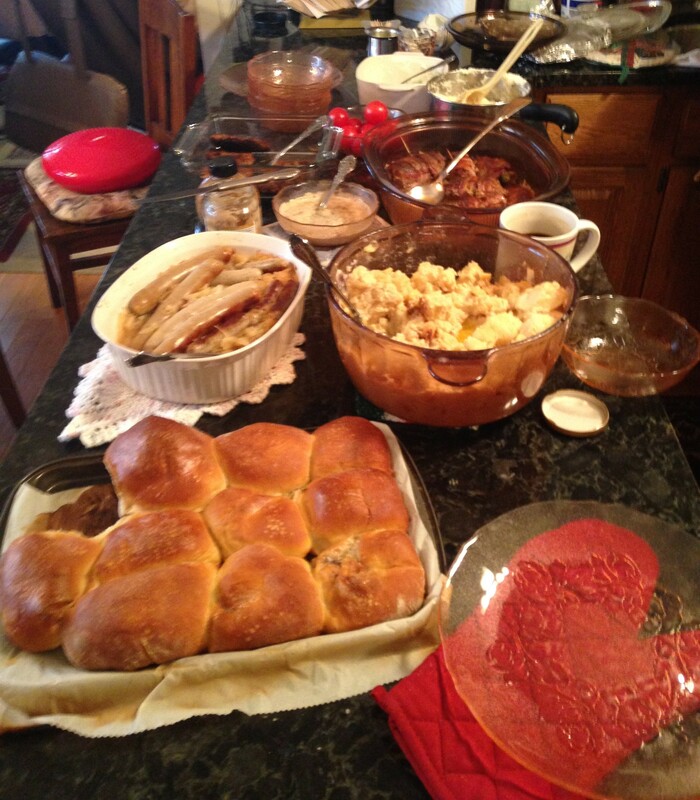 Ruth’s family shifted from German food to American food, so she did not recognize as many changes in German food. One example of this is that her rouladen did not have pickles inside. When she went to Germany with her church she had rouladen with a pickle in it and it surprised her. Taking the pickle out shows a difference in taste with food of family members here. From our perspective, the changes can be attributed to the lack of German ingredients in America and the different lifestyles based on Steve’s observations. The younger generation of German immigrants have different attitudes towards the traditional German food. In general, the younger generations would happy to consume German foods, however, they rarely learn how to cook German food, as shown with Henne’s sons. Henne stated, “One of my sons got married to a lady from Guam, so they cook different. When I go there I make some of the dishes he likes, like sauerkraut. He likes it, she doesn’t. I make rouladen every time I go there. I also cook tongue… They all come home and when they do come home there is certain things they want. Goulash is one of them…Rouladen is one of them…There is just certain things the kids like. I don’t know if they really cook like that, because I have all boys. 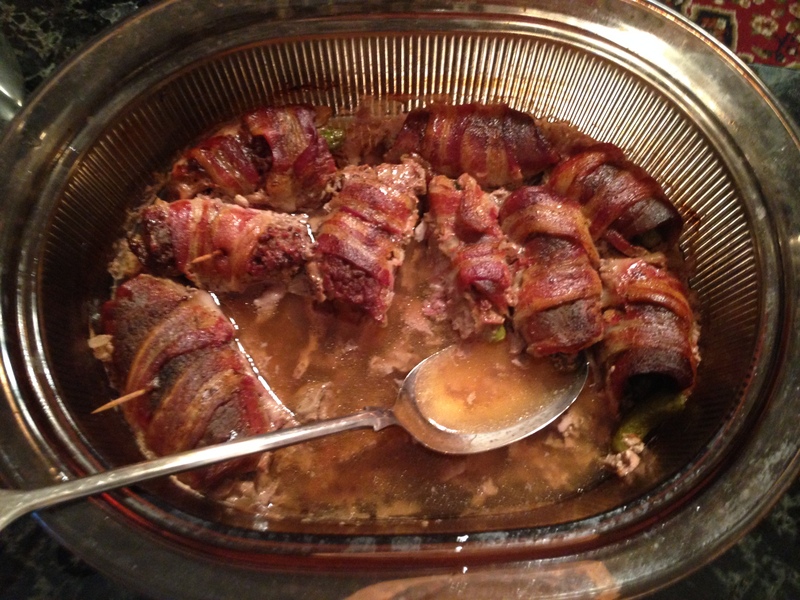 Their wives cook different.” Henne has five kids that were all raised in America. All of Henne’s children like to eat rouladen, German goulash, and sauerkraut when they visit her and she loves to cook for them. However, you see how there is a loss in participation in eating German food, because her kids eat primarily whatever their wives make. Photo 17. An assortment of German dishes prepared by Delores, Ruth, and Henne, including bierocks, sauerkraut, and rouladen. Ruth and her parents shifted from German food towards American food, but she still sometimes cooks German food for her children and they love Kartoffel N Glaze. Ruth has a similar experience with the dissipation of cooking German food in her family. 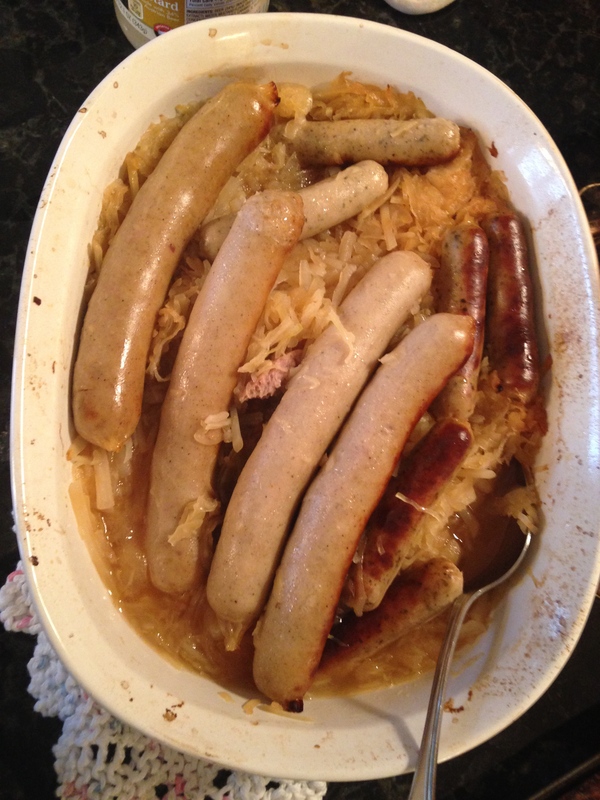 When asked about her kids’ participation in learning how to cook German food she replies, “They like rouladen and they like sauerbraten, but their wives do not like it… So, if I do [cook German food] they will eat [the German food. ]” On the other hand, Ruth’s children demonstrate little interest in learning how to cook German food. Steve is a unique case in the interview. He learned to cook from his mother and father (Delores and Robert). 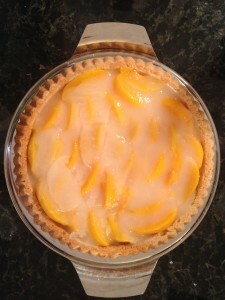 Steve said, “When I was younger I was amazed at how many of my male friends didn’t know how to cook. They didn’t even show a lot of interest in it. They liked to eat, but not necessarily cook. So, I would spend time watching [my parents] cook. I thought it was interesting how things were put together, how to get the flavors right, balance between too salty, too sweet.” Steve also faced the challenges of passing his cooking skills to his children since there are a lot of cultural backgrounds in his family. In efforts to teach others he explains, “Every time I cook something, whether it’s German or just something I come up with, I try to show whoever is home what’s going on, so they know in the future how to make this stuff, but nobody seems to show a lot of interest.” His wife is half Danish and half Swedish, and he is half German half Czech, as a result, their children have mixed with at least four different cultural backgrounds. His daughter, Emily, has shown the most interest in learning how to cook German food. Even though Emily has watched her father’s cooking a couple times, her attitude towards food is simply to consume whatever her parents provide on the table. Counihan notices a similar trend in her ethnography, Around the Tuscan Table, where younger generations of Italians are starting to eat the quicker, processed foods (Counihan 178). It is not about the art of making the food, but rather fueling up as quick as possible. Steve expresses how it will be difficult for younger generations to decide which kind of foods they want to learn to make. When his children have kids they could have eight or ten different backgrounds. At that point, what ethnic background do you chose to focus on? It seems that there is a trend from those that we interviewed of younger generations showing little interest not only in learning to cook German food but also in just cooking. Generally speaking, all of our informants have demonstrated having a difficulty for passing the traditional German cooking skills to their next generation even though the young have showed enthusiasm in eating German cuisine. One reason is that families have mixed cultural backgrounds, since America has a wide variety of ethnic and racial groups. These younger generations might have less of a desire to learn how to cook a single cultural background. Steve even mentions how his family loves to also cook Italian and Mexican food and in general enjoys trying to cook foods that look tasty. As immigrant’s children grow up in America, they are heavily influenced by the American culture. As a result, they generally prefer processed foods and pre-prepared meals like fast food, treating German food as something fresh and interesting. Another reason German food is being cooked less is that younger generations have less interest in learning to cook, especially males in family situations whose wives are primarily responsible for reproductive work. Through the experiences of Delores, Henne, Ruth, and Steve we see that German food has changed in the US. This is due to the fact the same ingredients are not available in both the United States and Germany, but also because some German foods are seen as strange or not to American taste. As generations progress in the US, both time and distance puts a gap between German Americans and German food itself. With this distance and fewer ties to the German culture, there is less interest in learning to cook German food by German Americans, especially since many German Americans do not have only a German background. The melting pot of America has led to the changing of German dishes and a culture saturated in many different ethnicities and backgrounds that interest in German cooking has dwindled for German-Americans as they adopt American culture. Clements, Barbara Evans. “Empresses and Serfs 1695-1855.” A History of Women in Russia: From Earliest times to the Present. N.p. : Indiana UP, 2012. N. pag. Print. Counihan, Carole. “Food and Gender: Toward the Future.” Around the Tuscan Table: Food, Family, and Gender in Twentieth Century Florence. New York: Routledge, 2004. N. pag. Print. Faust, Albert Bernhardt. The German Element in the United States: With Special Reference to Its Political, Moral, Social, and Educational Influence. Boston: Houghton, Mifflin, 1909. Print. Lawrence W. Baker, et al. “German Immigration.” U.S. Immigration and Migration Reference Library. Ed. Vol. 1: Vol. 1: Almanac. Detroit: UXL, 2004. 221-246. U.S. History in Context. Web. 8 Dec. 2015. Koenker, Diane, William G. Rosenberg, and Ronald Grigor. Suny. “Introduction: Social and Demographic Change in the Civil War.”Party, State, and Society in the Russian Civil War: Explorations in Social History. Bloomington: Indiana UP, 1989. 51-57. Print. Mawdsley, Evan. “PART I: 1918: Year of Decision.” The Russian Civil War. New York, NY: Pegasus, 2007. N. pag. Print. Yew, E. “Medical Inspection of Immigrants at Ellis Island, 1891-1924.” Bulletin of the New York Academy of Medicine 56.5 (1980): 488–510. Print.